Home > Used Vehicles > 2013 Honda Fit Sport,ALUMINUM WHEELS, AIR,TILT,CRUISE,PW,PL,LOCAL TRADE,CLEAN CARPROOF, LOOK AT THE KMS!!! 2013 Honda Fit Sport,ALUMINUM WHEELS, AIR,TILT,CRUISE,PW,PL,LOCAL TRADE,CLEAN CARPROOF, LOOK AT THE KMS!!! Cylinders: 1.5L I4 16V MPFI SOHC - 4 cyl. Low Mileage, Bluetooth, Fog Lights, Aluminum Wheels, Cruise Control! On sale now! This vehicle was originally listed at $14900. We've marked it down to $13900. You save $1000. 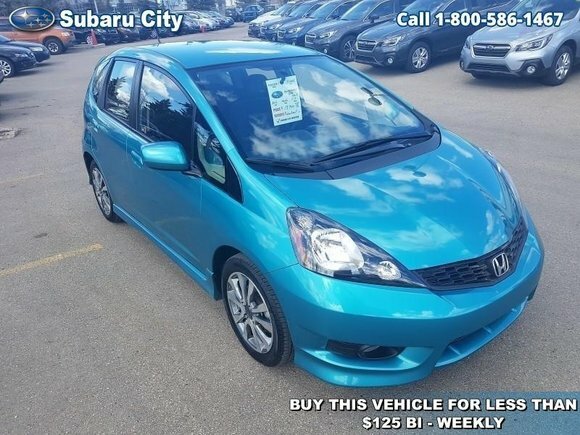 This 2013 Honda Fit is fresh on our lot in Edmonton. You could say that the Fit is synonymous with fun. It's fun to drive, full of fun tech features, and has room for fun when you're riding with four of your friends. Plus, it's even fun to park. All those small spots will suddenly feel bigger. Add in Honda-tuned handling and this is a ride you'll want to share. Plus, with impressive fuel economy ratings and Honda's legendary safety features, the Fit has a good head on its shoulders. This low mileage hatchback has just 33156 kms. It's cool turquoise metallic in colour. It has an automatic transmission and is powered by a 1.5L I4 16V MPFI SOHC engine. This vehicle has been upgraded with the following features: Bluetooth, Fog Lights, Aluminum Wheels, Cruise Control. Buy this vehicle now for the lowest bi-weekly payment of $123.69 with $1543 down for 60 months @ 5.99% APR O.A.C. ( taxes included, $790 Administration and Secure Ride included / Total cost of borrowing $2198 ). See dealer for details. Want to try the 2013 Honda Fit Sport?